Christmas is a time for entertaining, and for the host that means hours spent planning, shopping, cooking, and decorating the house. With a good guidebook in hand, the work of holiday entertaining can be one of the joys of the season. 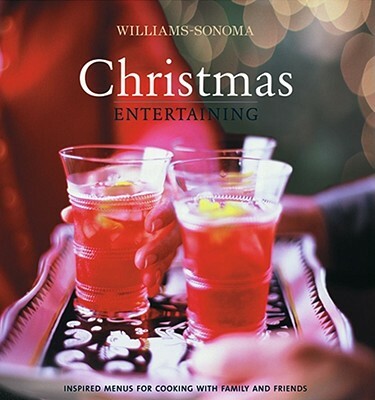 In Williams-Sonoma Christmas Entertaining, you'll discover everything you need to know to welcome guests into your home with style and ease. Organized around six festive holiday occasions, this book provides complete menus and decorating ideas, all designed to fit the way people like to entertain and spend time together today: a cozy Fireside Cocktail Party; an Italian Christmas Eve supper; a chic Christmas Eve in the City; a lavish, traditional New England Christmas; a sparkling Snow Country Breakfast; and a casual New Year's Day Open House. There are some fifty easy-to-master recipes for everything from make-ahead finger food to appetizers, main courses, and desserts. The beautiful color photography and step-by-step tyle and drink ideas make it easy to create elegant centerpieces, signature beverages, and delightful welcoming touches that transform the table and the house. helpful reference sections provide guidelines on tableware, setting up a buffet, selecting wine, and more. You can follow the detailed work plans included in each chapter to create a complete party, or mix and match recipes and ideas to assemble your menus. Either way, you'll find everything you need for hosting memorable holiday get-togethers with style and confidence.